At the southernmost tip of Albania, often only passed by on the way to Greece, lies a region where tourists are rare and visitors are still treated truly like guests. The municipality of Konispol is often overlooked by travellers. True, it has less of the dramatic mountain scenery of the “Riviera” or beaches that are full during the high season. However, if you want to experience authentic rural Albania, Konispol and its surrounding villages are a gem waiting to be discovered. The municipality stretches from the Butrint Archaeological Park just across from the Vivar Channel in the north, the plains of Vrina and Mursi to the Ionian Sea in the west, high mountains in the east and Greece in the south. The town of Konispol, perched on the slope of Mount Saraqin, is its administrative centre and is located only one kilometre from the Greek border. 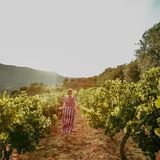 The hard-working residents in this area are mostly farmers, cultivating citrus and other fruit and olives, or make a living raising livestock. With around 13,700 inhabitants, almost four times as many sheep and goats, and 2700 cows providing milk for its four cheese factories, it is a rich agricultural region. It is also home to 3700 beehives, producing 110 tons of honey per year. The pride of the municipality though is undoubtedly its mandarin production, which is celebrated in an annual festival in November. Unlike the villages along the “Riviera”, the people of Konispol do not leave for Greece at the end of the seaside tourism season, and in the plains, young inhabitants have largely remained instead of emigrated. In addition to its pleasant Mediterranean climate, this makes a visit to this region worthwhile at any time of the year. So, if you are looking for a few quiet days away from the hustle and bustle of the seaside tourists, want to extend your visit to the Butrint Archaeological Park by a day or two, or are travelling overland from Albania to Greece along the coast, Konispol is an untouched region full of diverse activities, cultural and natural treasures and hospitality waiting for you. Konispol and its surrounding area have been inhabited all the way back to the Stone Age. Several archaeological finds point to Palaeolithic settlements in the region, one of which in Kreshmoi Cave dates back 27,000 years. Other archaeological points of interest include the Palaeolithic site of Xarra and Saint Marine cave on the south-eastern slope of Mount Mile. During antiquity, the area was inhabited by the Chaonians, a tribe that populated the ancient region of Epirus. Below the town of Konispoli lies the Vardhar valley, bordered in its north by the Hani George, through which roads connected Chaonia with the old Greek region of Thesprotia. Following the Chaonians, the Prasaebi and Cestrine tribes inhabited Konispol and its surroundings. During the 2nd century BC the area was conquered by and incorporated into the Roman Empire. During this time, the ancient city of Butrint flourished and extended across the Vivar Channel to take up large parts of the Vrina Plain. During this period, the aqueduct was constructed, bringing water to the city from the mountains near Xarra. After the fall of the Roman Empire, a tumultuous period began around the 6th century, and the region was fought over by Slavs, Ostrogoths, Bulgarians, the Byzantine Empire, Normans, Angevins and Venetians. Ali Pasha Tepelena incorporated it into the Ottoman Empire in 1799. As Ottoman society was organized based on the religionbased millet system and not on ethnic group, schools in the region, as elsewhere where Albanians lived, were conducted only in Turkish and Greek. Christian Albanians could attend Greek schools, and Muslim Albanians Turkish schools, but Albanian language schools were highly discouraged. Following the National Awakening (Rilindja) movement at the end of the 19th century, more and more Albanian-language schools were established, the first of which was opened in 1910 in Konispol. Other villages in the area followed, with a school opening in Mursi in 1917 and one in Shales in 1924. Following the First Balkan War in 1912-13, the region became part of the shortlived Autonomous Republic of Northern Epirus, before, following the First World War, being incorporated into the independent Albanian state in 1921. From the Albanian ethno-cultural point of view, the region is located at the borders of Labëria to the north and Çamëria to the south. Çamëria (Chameria) comprises the coastal part of the historical Greek region of Epirus and the southern tip of Albania. The population of this region are called Çamë (Chams) and are predominantly Albanianspeaking. Ethnicity and Religion The municipality of Konispol is ethnically diverse and is home to Orthodox Christian and Muslim populations. As elsewhere in Albania, the religious communities and ethnicities generally live with each other peacefully. Albanians form the majority of the population but there are several other groups, including Aromanians/Vlachs, Greeks and Romani, the percentage of which varies from village to village. The town of Konispol is a centre of Muslim Cham Albanians, who populate the villages of Dishat, Vërva, Shalës, Markat, Ninat and Janjar in the eastern part of the municipality. The villages of Xarra, Mursi and Çiflik on the other hand are mostly inhabited by Orthodox Albanians, alongside some Muslim Albanians, Aromanians, Greeks and Romani. In Xarra, the Muslim Albanian Cham population arrived from northern Greece in the 1920s and 1940s. Shkalla is majority Aromanian, with minorities of Muslim Albanians and Greeks. Vrina is a relatively new village, established during the communist period, and is populated nearly equally by Muslim and Orthodox Albanians and Greeks. Traditional Dress The dullamane, the common historical dress for women, is a long, velvet, red-, green- and cherry-coloured dress, embroidered at the collar, sleeves and hem. A short coat or knitted cardigan-like jacket was usually worn over the dress, often embellished with different motives. The womanâ&#x20AC;&#x2122;s head would be covered by a white, translucent triangular scarf, embroidered on all sides. During the Ottoman period, womenâ&#x20AC;&#x2122;s standard dress shifted towards another garment, called the citjane, which was made of a long strip of flowery fabric, wrapped artfully around the legs and waist, similar to traditional Ottoman pajamas. The torso was covered with a translucent white jacket with loose sleeves and a velvet vest. The most common menâ&#x20AC;&#x2122;s outfit was made up of a kneelength kilt known as fustanella, embroidered with silver thread, a snug jacket and a short shirt with loose sleeves. The head would be covered by a felt hat, qeleshe (similar to a fez) and leather clogs topped with red knots worn with white knitted socks covered the feet. The outfit was usually completed by a holster embroidered with silver thread used to carry a rifle or a pistol. Architecture Although interspersed with plenty of new construction, the region is home to some beautiful examples of traditional architecture. This includes massive stone houses with two to three storeys, usually built with arched windows and roofs covered with tiles or stone shingles. Another traditional structure is the kulla, a kind of small fortified tower, like the now ruined Tower of Jani in the village of Janjar. Unfortunately, few of these have survived till today, often only in the middle of forests, scrubland or in military zones near the Albanian border. 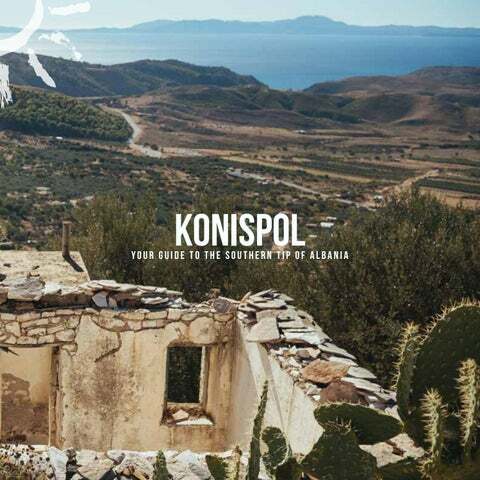 Konispol is the southernmost town in Albania, about a kilometre from the Greek border. It is built on top of a ridge and in the slopes of Mount Saraqin, with views towards the northwest and west, overseeing plains, Lake Butrint, the Ionian Sea and Corfu - a natural balcony 300 metres above the sea level. Konipol is home to some of the finest examples of traditional stone houses in the region, although many are in varying states of disrepair. In Shehat neighbourhood, seven of these two- or threestorey dwellings are designated cultural monuments. Generally constructed of stone, these buildings once hosted wealthy families, and have impressive vaulted stone gates, constructed to match the design of the main structure. The centre of the town has recently been restored, and youâ&#x20AC;&#x2122;ll find a handful of small shops, cafĂŠs, restaurants and a guesthouse. At the foot of a cone-shaped hill in Vadhar valley lies the village of Ă&#x2021;iflik. The village is mostly made up of newly constructed houses, interspersed with old stone houses here and there, a sports bar and a small shop. The inhabitants make a living in agriculture, particularly with mandarins, as well through livestock and beekeeping. Where the road ends at the highest part of the village begins a footpath to the top of the hill where the ancient city of Ă&#x2021;uka e Ajtoit once lay. On the other side of the village, to the north-west and across the Pavlla river, lies the Monastery of St. Nicholas. Shkalla might appear unremarkable at first sight, however its unique history makes it stand apart from other villages in the municipality. Apart from a few Muslim Cham Albanians and Greek families, the majority of the inhabitants are Aromanians, also known as Vlachs, once nomadic shepherds. They settled this village during the communist period, and are distinguished by their language, which is based on Latin and has similarities with Romanian. Furthermore, the village is home to a few families of Muslim Romani originally from Filiates, Greece, who were expelled over 1944-45. There is a quarry near the village that provided the limestone blocks for the monumental buildings of Butrint during antiquity. Shkalla has a dairy, located not far from the national road. As the mountainous terrain isnâ&#x20AC;&#x2122;t suitable for farming, the population makes most of its income from sheep and goat products. Atop a hill that gently rises from the Vrina plain, along the western shore of a small lake, lies the village of Mursi. It is one of the municipalityâ&#x20AC;&#x2122;s more important villages. The people living here are thought to have previously lived on Mile mountain to its northeast in the 18th century. The population of Mursi is predominantly Orthodox, and in the center you can find two small churches. There are also a few cafĂŠs, one restaurant on the northern shore of the lake near the national road, as well as a small supermarket. Most villagers make a living growing mandarins. The origin of the village known today as Xarra goes back around 45,000 years. The discovery of flint tools by Italian archaeologist Luigi Maria Ugolini in the 1930s indicates that the area has been settled already by the Middle Palaeolithic. This area also provided water to the ancient city in Butrint during the Roman period, which saw the construction of an aqueduct from Xarra across the plain and the Vivar channel into the city centre on the peninsula. Today Xarra is the seat of an administrative unit comprising the surrounding villages. It has a few cafĂŠs and other shops. There is also a dairy and even a tattoo shop. The village of Vrina is quite new, having been established during the communist period, but the surrounding area has been inhabited for centuries. In the 2nd century BC, the Romans extended the city of Butrint from the peninsula onto the plain, where a new district with villas and public buildings was constructed. In the 6th century, this area was called Cestrine valley, named after the son of Andromache and Helenus of Troy, Cestrinus. Over time, the plain became marshland, and was only reclaimed in the second half of the 20th century during the communist regime. The dense forest on top of the hill was cleared, and people from the surrounding areas settled here. In 1956, the Vrina Agricultural Cooperative was established, producing chiefly wheat and citrus as well as managing livestock. Even today, the villagers still mainly work in agriculture, but the village does host three cafes and two small minimarkets. Just across the national road from Vrina lies the village of Shëndëlliaj, also located on a small hill. On the very top of the hill one finds the village church, built in 1831, which stands on old Roman ruins. After being destroyed in the 1967 cultural revolution that saw religion banned, it was restored in 1994. It has a simple interior with a wooden iconostasis. From the church hilltop, you can enjoy great views of the surrounding olive plantations and fields, Lake Butrint and the peninsula. To access the church, simply open the large gate leading though the olive plantation; on the other side, you’ll find a small gate to enter the church yard (neither is locked). The people of Shëndëlliaj mainly originate from the Mirdita highlands, only settling around the year 2000 when free movement was reinstated after the fall of communism. They make a living through agriculture and animal husbandry. The first and largest village of this side valley, Shalës spreads out over two facing slopes of Mount Saraqin and Mount Mellez. Inhabited as early as in the Neolithic period, the village is also found in Ottoman documents from the 15th century. Many newly constructed houses surround the mosque in the centre, while towards the back of the valley some older stone houses are still visible. Shalës has a few cafés, mainly frequented by the men of the village, as well as a minimarket along the main road. Most villagers earn income from the surrounding olive plantations, as whole olives or from the oil, as well as from livestock. Driving up the long and winding gravel road from Shalës takes you deeper into the valley and to the village of Dishat. Archaeological excavations near the village have discovered clay and metal objects dating from the 3rd century BC up through the Middle Ages, indicating that the area has been populated since antiquity. In Dishat one can note the dry-stone walls typical for the region surrounding many properties. Some traditional stone houses have been restored. One of the smaller villages in the municipality, the remaining population of Dishat makes a living from livestock and wool products, as well as from fruit. Continuing from Dishat onwards, the landscape opens up, unfolding into a high plateau, with the reservoir to your left. Soon after you will reach Verva, the last village of this valley. The village feels almost deserted, but after wandering around you will quickly come across houses where the few dozen inhabitants still reside. In the centre of the village lies the former school and communist cultural centre, which are unused today. Further up the mountainside there are a number of well-preserved stone estates. Situated just a few hundred metres from the Greek border, people here make a living mostly through animal husbandry. Continuing along the rocky road, flanked by vineyards, brings you to the municipality of Konispolâ&#x20AC;&#x2122;s most remote village. Janjarâ&#x20AC;&#x2122;s settlement dates back to Illyrian times. Ruins of a monastery dating back to the 4th or 5th century have been discovered in the area as well. The village is spread out over several neighbourhoods, with the oldest part located along a ridge to the north. The three-storey Tower of Jani was once located in the south of the village. Four metres wide and 15 metres high, it was well preserved until the 19th century, though it lies in ruins today. The locals live mainly by cultivating olives and raising livestock. The village has a nearby reservoir, an artificial lake used for irrigation, which can be reached by turning off to the right before arriving at the village. The municipality of Konispol’s diverse landscape offers plenty of walks for different fitness levels. Lake Bufi This is an easy hike along the Vivar channel and around the natural Lake Bufi. SInce the terrain is flat and mostly follows wide dirt paths, it is suitable for all fitness levels. Starting from the village of Shëndëlliaj, the 10 km walk takes about 2.5 hours. If you start from the eastern side near the SH98 national road, it is slightly shorter. This walk is great for nature lovers, but can also be adjusted to incorporate some historical sites, like Kalivo, Diaporit, the Xarra aqueduct remains and Roman villas (see “Discover Archaeological Sites Off the Beaten Track”). Vrina plain walk Another easy hike of about 10 km on level ground leads through the Vrina plain. This area used to be covered in dense forest until the 1960s, when it was transformed into agricultural land. This, however leads to parts of the plain being flooded during the winter. This hike is great for spotting birds and other wildlife (see “Wildlife and Bird Watching at Butrint NP”). It starts at the southern cable ferry station, and follows the shore of the Vivar channel, sea, and Pavlla river, before cutting through the fields to close the circle in about 3 hours. Çuka e Ajtoit This cone-shaped hill is reminiscent of Cape Town’s famous Lion’s Head, but at only about 230m, it is somewhat smaller. Located right next to the village of Çiflik, Çuka e Ajtoit was a fortified hill settlement from the 4th or 3rd century BC until about the 4th century AD. The retaining walls enclose an area of about 7.5 hectares. With its strategic location along important ancient trade routes, and overlooking the entire plain, its main purpose was that of an outpost to protect Butrint. The trail to the top starts at the highest part of village, clearly visible at the last house just where the road ends. Along a rocky footpath it takes about 30 minutes to the top, where you can marvel at the massive stone blocks of the ancient fortification, with views on all sides. Mount Mile After a long hike to the top of Mount Mile, to the east of Xarra, you’ll be rewarded with spectacular views. At 823 metres elevation, you can see from Lake Butrint and Lake Bufi to the Ionian Sea and Corfu, as well as over the Vrina plain, and towards the hilly border with Greece. With an ascent of about 650 metres and a distance to the summit of about 4 km, the top can be reached in about 2 hours. The mountain can be approached either from a dirt road turnoff from the SH98 national road, about 2 km south of the village Vurgu i Ri, or from the eastern side from the village of Vagalat. The most well-known site to visit in the area is clearly Butrint Archaeological Park, which can be described as a microcosm of Albanian history. In 1992, it was the first site in the country to be inscribed on the list of UNESCO World Heritage Sites, and it has been discovered by thousands of visitors every year. However, just outside of the peninsula, where most of the excavated areas lie, there is plenty to be seen. The municipality of Konispol is a true treasure trove for visitors interested in history and archaeology: The municipality boasts sites dating from the Palaeolithic to Bronze Age fortifications, from Roman remains to 13th century church ruins. Butrint’s extended Roman district on the Vrina plain Under Roman rule, starting from the 1st century BC, the city of Butrint was extended along the other side of the Vivar channel. The new district included residential villas and public buildings such as Roman baths. In fact some remnants of Roman villas have been found in the fields near the current-day village of Shëndëlliaj, to the north. Even the village’s church has been discovered to have been built on top of former Roman dwellings. A bit further to the east, the village of Xarra lies on top of a small hill. It is from a spring here, archaeologists believe, that the city of Butrint drew its water supply. In order to transport the water across the Vivar Channel, a 3.5 km long aqueduct was constructed, rising up to 6 metres above the ground. It was supported by arches, the pillars of which were spaced about 3.5 metres apart. A branch of the aqueduct also supplied this new district on the Vrina plain. The bases of some of the pillars, signposted from the main road, can still be seen today near Xarra. The sites are a bit difficult to find on your own, so taking a guide with you is recommended. Kalivo Across the Butrint peninsula, between Lake Butrint and Lake Bufi, lies a hill that was the site of the bronzeage settlement of Kalivo. The hill is about 80 metres high, and its top was first used as a settlement in the 12th century BC. The Italian archaeologist Luigi Maria Ugulini, who led a number of digs in Butrint in the 1920s and 1930s, discovered bronze-age stone tools here. In the 6th century BC, during the war between the Kaon tribes and the Corfu-based conquerors, it was fortified with massive walls 1.3 km in length, small sections of which can still be seen today mostly on the eastern and southern side of the hill. Kalivo is part of the Butrint Archaeological Park and is included as part of the same UNESCO World Heritage site. A footpath from Lake Bufi leads to Kalivo hill from the east. From the west it can be accessed walking along the shore of the Vivar channel, depending on the season. Diaporit On the south-west shore of Lake Butrint lies another archaeological site from the Roman period, the foundations of a large Roman villa. Nearby one can find the ruins of a palaeo-Christian church, built in the 6th century. The ruins can be reached via a walking path that forks off from the Lake Bufi trail to the northwest. Alternatively, the site is reachable by boat (see the Boat Trips section). Malathre fort To the left of the road, when travelling from Mursi to Konispol, perched onto a small, barren hill at the foot of Mount Mile, one can see the ruins of Malathre fort. The fortification was built in the 4th to 3rd century BC, and was used again between the 1st and 4th century AD. Its position and size indicate that it was mainly used to control the road below it. Archaeologists also presume that has served as a pre-fortress for the settlement of Çuka of Ajtoit. Malathe fort was laid out in a square shape built from large stone blocks, with a length of around 18 metres on all sides and a wall thickness of up to 1.2 metres. Its corners were fortified with towers, two of which are still visible. During the second period of use it was transformed into a Roman villa rustica with nine additional utilitarian rooms, extending the square into a rectangle layout and creating a south-facing façade. The side walls are built with stone blocks like the first fortification, but poorly hewn, while the interior walls are made of small stones and larger slabs. Generally, the architecture of the extension is rather bare, indicating the utilitarian nature of buildings during this period. St. Nicholas Basilica and Monastery Continuing south, just before crossing the Pavlla river, a dirt road forks off on the right hand side that leads to the ruins of the monastery and church dedicated to St. Nicholas (Shën Koll), about 700 metres to the north-west of the village of Çiflik. The turnoff is not signposted. The road leads through mandarin plantations until reaching a large concrete building used as a stable for sheep. Fifty metres on to the left, one finds the remnants of the church, which stems from the 18th century, though a foundation of bricks and tile fragments of an older Byzantine church from the 11th and 15th centuries lie underneath. The adjacent monastery was built around the 17th century. St. Marine’s Cave Located in the Bogaz gorge, along the national road SH97, which passes from Shkalla towards the eastern part of the municipality, set high up along a steep slope of Mount Mile lies this Middle Palaeolithic cave, known in Albanian as Shpella e Shën Marinës. It is considered to be one of the oldest known settlements in Albania, first discovered by an Italian archaeological mission in the 1930s. Findings from this period include two flint scrapers, the horns of a goat and a fire ash heap. Later is was used as a place of worship by Christians, as indicated by the figure of a priest or a saint painted on the left side of the rock, and was transformed into a kind of cave church in recent years. A wooden staircase has been built for easier access to the upper part of the cave, which is up to 6 metres high. The hike to the cave starts at the main road in Bogaz gorge, and doesn’t follow any particular, defined walking path. Finding your own way up the steep mountain slope, with the cave in sight above for a general direction, the hike takes about 45 minutes, one way. Krëshmoi Cave This cave, known as Shpella e Krëshmoit in Albanian, is located on the southern slope of Mount Saraqin, 400 m above sea level, and about 1.5 km north of the Town of Konispol. This southwest facing cave was first used for habitation over 27,000 years and has been used throughout the millennia since. The cave is about 50 metres long in total, divided into two branches, reaching a width and height of 6 metres. Excavations in the sediment of the cave brought to light findings from the upper Palaeolithic, Mesolithic and Neolithic. Tools made from bones, earthenware, painted pottery, terracotta and mud sculptures, fossilised seeds of wild barley, wild grapes, and goat, sheep and cow bones comprise just some of the materials discovered. Amongst the most prominent findings is the head of a female, which the archaeologists have named the “Beauty of Konispol”. The cave was named after Lent (krëshmo), given its function as a pilgrimage place for Christians, where believers came to fast and pray. Starting from Konispol, the hike out and back to the cave is 3 hours, and since the cave is not easy to find, it’s best to be undertaken accompanied by a local guide. Driving past the fields of Xarra and Vrina, and further onto Konispol, you won’t fail to notice the abundant citrus trees. The area’s conditions are ideal for mandarin cultivation, but other citrus such as orange, lemon, grapefruit and lime are grown. Within the municipality, more than 480 hectares of mandarin plantations are cultivated, comprising more than 150,000 mature and 135,000 immature trees. A tree in full production can carry 115 kg of fruit on average, leading to a total production of about 23,000 tons of citrus per year for the entire region. This provides work for up to 2000 people in the surrounding villages, but also from other parts of the country during harvest season. At the three mandarin processing lines within the municipality, up to 10 tons of fruit can be processed per hour. Approximately 8,500 tons of mandarins from here are exported, mainly to Kosovo, but also to Europe, including Poland, Austria, and the Netherlands. Citrus cultivation is a major economic driver, and brings the region about 8 million Euros in revenues every year. The mandarin harvest season starts around October or November, which is also when the municipality celebrates the harvest with its annual Mandarin Festival. The festival includes exhibitions, concerts, children’s games, as well as traditional costumes and dances. Details for the current year’s festival, including exact dates, location and programme, can be found on facebook.com/mandarinafest/. If you would like to gain insight into local agriculture life, check out one of these mandarin plantations. Of the over 80 farms in the region, take a tour to the Danga family farm, located on 4 hectares of land on a small hill near Xarra. The family cultivates different types of citrus, pomegranates, olives and walnuts, has 4 permanent workers and up to 12 during the harvest season, and is happy to show visitors around. A rest area to offer drinks and traditional local food to visitors is in the works. If you would like to combine your plantation tour with other activities in the area, Gabby Travel offers daytrips including hikes and visits to local families. The Butrint National Park contains Lake Butrint, the Vivar Channel, plains on the southern shore of the channel leading to the Pavlla river and the villages of Vrina and ShĂŤndĂŤlliaj. Lake Butrint is a salt-water lagoon. The lake and adjoining Vivar Channel, the natural connection between the lake and the Ionian Sea at the Strait of Corfu, are affected by the tide. The plains of Vrina and Xarra are seasonal wetlands, and are flooded during the winter months. The lake and surrounding marshlands have been listed as a Ramsar protected area, and were declared a national park in 2000. The area is particularly rich in wildlife, including 246 different species of birds, 25 species of reptiles, 10 species of amphibia, 39 species of mammals and 105 species of fish. Ninetyfive species present in the national park (38% of all observed species) are considered endangered in Europe. With such a high number of species, Butrint is an important natural protection site on a European scale. Furthermore, the national park shelters 35 species of Global Conservation Concern. Birds The wetlands are an important site for local and migratory birds (and those looking to catch a glimpse of them!). Their habitat and species diversity have increased over the last few years, as new wetlands have been created due to collapse of drainage canals in the surrounding fields. This has affected waterfowl in particular, which use these shallow waters (fresh and brackish) as resting and feeding sites. The majority of species are recorded in winter, when more than 8000 individuals have been counted. Diving species dominate the bird community. The most common species are the great crested grebe (Podiceps cristatus), cormorant (Phalacrocorax carbo), common pochard (Aythya ferina), the Eurasian coot (Fulica atra) and Black-headed Gull (Larus ridibundus). Other bird habitats include the more rocky areas, where the golden eagle (Aquila chrysaetos), peregrine falcon (Falco peregrinus), rock partridge (Alectoris graeca), blue rock thrush (Monticola solitarius) and western rock nuthatch (Sitta neumayer) can be spotted, and dry areas with species such as the crested lark (Galerida cristata), meadow pipit (Anthus pratensis), pied wagtail (Motacilla alba), common starling (Sturnus vulgaris), fieldfare (Turdus pilaris) and goldfinch (Carduelis carduelis). Itâ&#x20AC;&#x2122;s also worth noting a number of globally endangered species that can be found within the park: pygmy cormorant (Phalacrocorax pygmeus), Dalmatian pelican (Pelecanus crispus), red-breasted goose (Branta ruficollis), marbled duck (Marmaronetta angustirostris), ferruginous duck (Aythya nyroca), white-headed duck (Oxyura leucocephala), white-tailed eagle (Haliaeetus albicilla), cinereous vulture (Aegypius monachus), greater spotted eagle (Aquila clanga), lesser kestrel (Falco naumanni), great bustard (Otis tarda), great snipe (Gallinago media) and the slender-billed curlew (Numenius tenuirostris). The best spots for bird-watching are at the southeastern corner of Bufi lake, the mouth of the Pavlla river, the mouth of the Vivar channel, as well on the Butrint peninsula. These are reachable on foot or by boat. Bats and other Mammals Apart from birds, the region is habitat to a variety of mammals. Thirty-nine species of mammals have been observed within the park. Noteworthy is the population of bats, several of which are globally endangered. These include the Blasius’ horseshoe bat (Rhinolophus blasii), mediterranean horseshoe bat (Rhinolophus euryale), greater horseshoe bat (Rhinolophus ferrumequinum), common bentwing bat (Miniopterus schreibersii), geoffroy’s bat (Myotis emarginatus), greater mouse-eared bat (Myotis myotis) and long-fingered bat (Myotis capacinii). Near the border with Greece, to the southwest of the Vrina plain, the hilly terrain around the Stillo Cape is also home to two more rare animals: Wolves (Canis lupus) and the Mediterranean monk seal (Monachus monachus). Along the Pavlla River it is possible to spot Eurasian otters (lutra lutra). Amphibians and Reptiles Visitors to Butrint will almost certainly have the chance to spot a few of the European Pond Terrapin (Emys orbicularis) near the agora or gymnasium, but there are even more species of amphibians and reptiles to be found within the larger area of the park. Among these are the endangered Great Crested Newt (Triturus cristatus) and the European Tree Frog (Hyla arborea), as well as the Marginated Tortoise (Testudo marginata), Hermann’s Tortoise (Testudo hermanni) and the Leopard Snake (Elaphe situla). Near the seashore Loggerheads (Caretta caretta) and Leatherbacks (Dermochelys coriacea) can be spotted. For more information on the fauna and flora found in the park, check out the Butrint National Park Management Plan 2010, which is available on the official park website (see section “Further Information”) and is currently being revised. The municipalityâ&#x20AC;&#x2122;s terrain make for great cycling and mountain biking on stretches of quiet, freshly-paved roads with beautiful views, and dirt roads in the more remote parts. Road cycling, on the way from Saranda to Greece, is possible along the SH81 and SH98 roads, the former passing through the plains but with older, patchier asphalt, while the latter was recently asphalted, but is hillier. For mountain bikers, the gravel road up to the top of Mount Mile is a great option, while the access roads to the villages of Dishat and Verve, as well as Ninat and Janjar make great day trips with scenic views. While there is currently no signed network of cycling routes in place, the municipality is looking into developing better infrastructure, so itâ&#x20AC;&#x2122;s worth checking back on www.south.al before your future trip. For those who are not travelling with their own bikes, Gabby Travel offers bike rentals out of Saranda. Cable ferry Take the cable ferry to cross the Vivar channel and reach the municipality of Konispol to the south of Butrint. This curious, seemingly improvised vessel is a sight in itself; visitors can watch the swimming platform, made from a metal hull and wooden deck, make its way from one shore to the other across the 70-metre wide channel, pulled along a cable. It transports pedestrians as well as vehicles, and is mainly used by locals of the nearby villages. Itâ&#x20AC;&#x2122;s not a boat trip per se, but the ride is inexpensive, and coming from Butrint, it gives you a chance to see the Triangular Fortress up close, right on the other side of the channel from Butrint. The ferry operates year-round and tickets cost 75 LekĂŤ per person and 700 LekĂŤ per car. Lake Butrint Moving to the east through the Vivar Channel, one can explore Lake Butrint and surroundings by boat. The archaeological sites of Kalivo and Diaporit, as described earlier, are easy to access and make a worthwhile boat trip. Another interesting experience and great opportunity for a cruise around Lake Butrint is a mussel tour, offered by Soraldo Nevo from Ksamil. After learning about mussel farming first hand, which was introduced in the lake in the 1950s, guests are treated to a lunch to taste local specialities. Ali Pasha Castle and Coast of Konispol Given how rich the area is in water from the lake, channel and sea, a great option to explore it is by boat. A popular destination is the castle at the mouth of the Vivar channel, built in the early 19th century by Ali Pasha of Tepelena, a famous warlord well known to the French and English courts of the time. The 20-minute boat ride passes the remains of a small church and shrine, a Roman villa, a customs house from the 1920s, as well as several bunkers from the communist period, reminding you of the proximity of the Greek border. It is also possible to extend the trip along the coast to the south. There youâ&#x20AC;&#x2122;ll pass birdwatching spots, mussel farms, Cape Stillo and the two small islands of Tongo and Stillo. In the other direction, the shores north of the channel offer some quiet beaches which can be comfortably reached by boat. Ramiz Emini, who also goes by Dajko Xarra, offers a ferry service to these places. Other boats lie at a small dock near the cable ferry; ask the ferry operator to call a boatsman for you should there be no one there. For those whoâ&#x20AC;&#x2122;d like to more actively experience the waters of the national park, kayaking is a great option, in either Lake Butrint or the Vivar channel. The best starting points for this activity are near the cable ferry, to go along the channel towards the sea, or from the small fishing settlement east of the Triangular Castle to explore the lake. Starting near the cable ferry, the Ali Pasha Castle at the mouth of the channel can be reached after paddling for about 2.3km. A stop for stretching your legs and exploring is possible at a customs house built during the reign of King Zog in the early 20th century, located on the northern shore, which is surrounded by bunkers from the communist period. This place can also be reached by a dirt road off the SH81 national road, and makes for a good starting point for kayaking along the coast.Going eastwards, the calm waters of lake Butrint are a great area to be explored by kayak. If you are keen on stopping along the shore, the ancient site of Kalivo can be reached after 1.8km, while the Roman villa and church remains of Diaporit are about 3.3km far from the starting point. On the northern shore, you can see the Butrint peninsula from the water and follow the ancient fortification walls. Unfortunately, at this point it is not possible to rent kayaks in the vicinity of the municipality, so this is only an option if you bring your own equipment. The food in the region can be best described as a mixture of Albanian and Greek cuisine, and maintains many characteristics of general Mediterranean and Ottoman culinary influences. Konispol has a rich tradition of local specialities. Overall, you’ll find the food to be of high quality and quite diverse. Some traditional dishes found in the region include paça prerë, çorba (a typicial soup from the region), çomlek me qepë, burdheto me peshk, lakror me gjalpë (a pastry of two layers with a savoury filling), and trahana me miell dhe kos. Desserts of the region include bakllava (known as Baklava in English, a multi-layer filo dough pastry stuffed with almonds and other nuts, soaked in syrup), the most popular deserts of the Konispol cuisine revani (two varieties, one with milk and one with starch), lokume (Turkish delight) and ashura (a pudding made of boiled wheat with nuts, raisins and cinnamon). If you’d like to try some of these delicacies, check out the restaurants in Mursi and Konispol (see section “Local Contacts and Services”). Maybe the best way to experience the cuisine and hospitality of the region is through a day trip which includes a visit to a local family and a home cooked meal. Gabby Travel organises such tours. During your meal, you should try the local cheese, or djath, which is a white cheese similar to feta and is made of sheep’s, cow’s or sometimes goat’s milk. It is produced in Konispol, Shkalla and Xarra, where you can see the production and also to buy some cheese. One ingredient that won’t be missing in any Konispol kitchen is olive oil. The region has a tradition of olive cultivation, and villagers are adding new trees to ensure continuity of its centuries-old legacy. The harvesting and olive oil processing gives work to a number locals in Shalës and Markat, as well as Konispol. For a bottle of olive oil to bring back home, visit the olive mill and oil production site of Arben and Shkelqim Goxhai. Road conditions within the municipality are generally good along the national roads and large stretches have been freshly paved. Only between Xarra and Shkalla the road is narrower and in worse condition. Similarly, coming from Butrint via the cable ferry towards Xarra, the road is mostly narrow and patched up for the first few kilometres. In the east of the municipality, the road to Markat is unpaved from the turnoff off the national road onwards, with a stretch of good asphalt leading up to the centre of the village. Ninat, Janjar, Dishat and Vërva are only accessible via dirt roads, which include steep and narrow turns, so drive carefully. Many locals are able to reach them with normal passenger cars, but they are best accessed with a four-wheel drive vehicle. Generally, roads are to be used with care, as you’ll share them with shepherds and livestock. Albanian phone signal covers most of the municipality. Some parts are only covered by 2G mobile internet or not at all. From the village of Markat and towards Greece, as well as in Dishat and Verve, Greek mobile phone networks work better, and might be more favourable for travellers from the EU. A quick note on spelling: nouns in Albania, including place names, are written with or without the definite article depending on the context. You might encounter signs or guides with names ending in ë which are otherwise spelt with an a (for example, Sarandë or Saranda), or with or without the letter i at the end of a noun (for example, Butrint or Butrinti). Don’t worry, these are the same place! We’ve tried to be consistent in our spelling in this guide book. Don’t forget to visit www.south.al, a comprehensive resource for the region and the whole southern coast of Albania. As a federally owned enterprise, GIZ supports the German Government in achieving its objectives in the field of international cooperation for sustainable development. Published by the Deutsche Gesellschaft für Internationale Zusammenarbeit (GIZ) GmbH Registered offices Bonn and Eschborn, Germany ‘Integrated Sustainable Development of the Southern Coastal Region‘ Programme Rr. “Skenderbej” 21/1 T +355 42 230 414 www.giz.de/en/worldwide/294.html Programme Coordinators Hans-Jürgen Cassens / GIZ Country Director Dhurata Gazulli / ISDSCR Programme Coordinator Valbona Koçi / ISDSCR Programme Coordinator Design and layout Eneida Berisha Photo credits Armand Habazaj unless otherwise stated Text Ulrike Schilling Editing Seth Pyenson Printed by Copyright with GIZ GIZ is responsible for the content of this publication.